Weak to Wolf Knight's Greatsword. Midir, descendant of Archdragons, was raised by the gods, and owing to his immortality was given a duty to eternally battle the dark, a duty that he would never forget, even after the gods perished. To watch over the sleeping Princess, true to the old accord. In a huge cave under Filianore's Church. Near the Gwyn Statue Room there's an elevator leading to the shortcut back to the Ringed Inner Wall bonfire. In the elevator shaft is an opening. Go inside and go left to a round room with Silver Knight statues. The one without a sword is an illusory wall. Follow the path down the ladder into a small chapel. Drop down into Midir's boss room behind the altar. 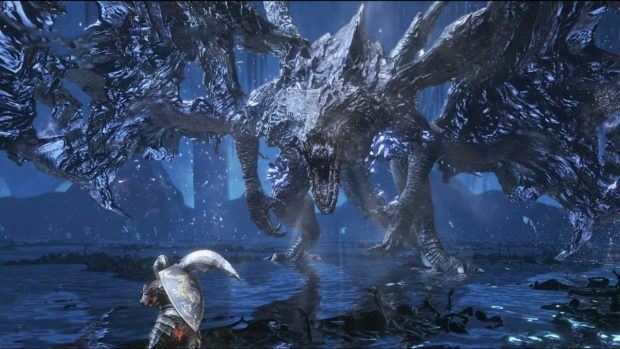 Midir is an extremely resilient boss that is most vulnerable to physical and lightning attacks. His head takes twice as much damage as the rest of his body, so the most effective strategy is to remain in front of him and attack his head at the end of melee combos. It is safe to roll through his flame breath attacks, unless they are being fired directly at the ground. Midir doesn't change much in his second phase. He gains a dark explosion that can be avoided by running away, and can conjure humanity sprites by roaring, which can be dodged by sprinting to the side. He will sometimes do this after swiping or biting. He has a powerful laser attack that can be avoided by moving towards his front left leg - he will always hop backwards before this move. If you cannot close the distance, note that he will sweep the laser forward three times during this combo.